The Ahmed Kathrada Foundation will on August 30 take the leadership of the Economic Freedom Fighters (EFF) for a tour of Robben Island. The tour will be conducted in accordance with the wishes of former Robben Island prisoner, Ahmed Kathrada, who passed away in March this year. It will also form part of the National Programme of Tribute on Kathrada’s life and legacy. His long-time comrade, fellow Robben Island prisoner, and Foundation Board member, Laloo Chiba (86) will lead the tour. He will be accompanied by several other members of the Foundation’s Board, including Kathrada’s wife, herself a former political prisoner, Barbara Hogan. “Before his passing, Kathrada expressed a wish to take leaders of the opposition parties, Mmusi Maimane and Julius Malema, for a tour of the Island. This was noted at Kathrada’s funeral. Subsequently, the EFF, to mark what would have been Kathrada’s 88th birthday on August 21, requested that the Foundation conduct a tour for its leadership – including EFF President, Julius Malema – before the end of the month,” said Neeshan Balton, the Foundation’s Executive Director. “That Chiba will be conducting the tour makes it highly significant. Chiba was an Umkhonto we Sizwe platoon commander, and spent 18 years on Robben Island in B Section, alongside Walter Sisulu, Nelson Mandela, Kathrada and several other Rivonia and Little Rivonia Trialists. Chiba is amongst the last of a generation of stalwarts, who served alongside Madiba in B-Section, which was reserved for political prisoners only. “While Kathrada conducted some 300 Robben Island tours with guests from around the world, Chiba on the other hand, has only been back to the place of his imprisonment several times. Unlike Kathrada, the Island still evokes deeply painful memories for him. Those who have been with him to the Island before, have found the experience to be a very emotional one. “Despite his age, and health conditions that do not usually permit him to travel long distances – in this instance from Johannesburg to Cape Town – he has still agreed to do the trip. 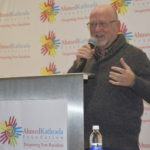 He is doing so not only to honour Katharada’s memory, but to share the Island’s history with a new generation of political activists and influential young leaders,” Balton said.